His directorial film work includes Mission: Impossible III (2006), Star Trek (2009), Super 8 (2011), and Star Trek Into Darkness (2013). He also directed, produced and co-wrote Star Wars: The Force Awakens, the first film in the Star Wars sequel trilogy and his highest-grossing film, as well as the third-highest-grossing film of all time. He returned to Star Wars by co-writing, producing and directing The Rise of Skywalker. In 1994, he was part of the "Propellerheads" with Rob Letterman, Loren Soman, and Andy Waisler, a group of Sarah Lawrence alums experimenting with computer animation technology. They were contracted by Jeffrey Katzenberg to develop animation for the film Shrek. Abrams worked on the screenplay for the 1998 film Armageddon with producer Jerry Bruckheimer and director Michael Bay. That same year, he made his first foray into television with Felicity, which ran for four seasons on The WB Network, serving as the series' co-creator (with Matt Reeves) and executive producer. He also composed its opening theme music. Under his production company, Bad Robot, which he founded with Bryan Burk in 2001, Abrams created and executive-produced ABC's Alias and is co-creator (along with Damon Lindelof and Jeffrey Lieber) and was executive producer of Lost. As with Felicity, Abrams also composed the opening theme music for Alias and Lost. Abrams directed and wrote the two-part pilot for Lost and remained active producer for the first half of the season. Also in 2001, Abrams co-wrote and produced the horror-thriller Joy Ride. In 2006, he served as executive producer of What About Brian and Six Degrees, also on ABC. He also co-wrote the teleplay for Lost's third-season premiere "A Tale of Two Cities" and the same year, he made his feature directorial debut with Mission: Impossible III, starring Tom Cruise. Abrams spoke at the TED conference in 2007. In 2008, it was reported that Abrams purchased the rights to a New York Times article "Mystery on Fifth Avenue" about the renovation of an 8.5 million dollar co-op, a division of property originally owned by E. F. Hutton & Co. and Marjorie Merriweather Post, for six figures and was developing a film titled Mystery on Fifth Avenue, with Paramount Pictures and Bad Robot Productions, and comedy writers Maya Forbes and Wally Wolodarsky to write the adaptation. According to the article, a wealthy couple Steven B. Klinsky and Maureen Sherry purchased the apartment in 2003 and live there with their four children. Soon after purchasing the apartment, they hired young architectural designer Eric Clough, who devised an elaborately clever "scavenger hunt" built into the apartment that involved dozens of historical figures, a fictional book and a soundtrack, woven throughout the apartment in puzzles, riddles, secret panels, compartments, and hidden codes, without the couple's knowledge. The family didn't discover the embedded mystery until months after moving into the apartment. After Abrams purchased the article, Clough left him an encrypted message in the wall tiles of a Christian Louboutin shoe store he designed in West Hollywood. He wrote and directed the Paramount science fiction thriller Super 8, starring Joel Courtney and Elle Fanning, while co-producing with Steven Spielberg and Bryan Burk; it was released on June 10, 2011. Abrams directed the sequel to Star Trek, Star Trek Into Darkness, released in May 2013. The film ended being considered less original than its predecessor and more of a loose remake of Star Trek II: Wrath of Khan. Despite critics reacting positively towards the film, the director of Star Trek II: Wrath of Khan from which Into Darkness borrowed lines and plot elements, revealed in 2018, to have been disappointed with the film. He was quoted saying: "In my sort of artistic worldview, if you’re going to do an homage, you have to add something. You have to put another layer on it, and they didn’t. Just by putting the same words in different characters’ mouths didn't add up to anything, and if you have someone dying in one scene and sort of being resurrected immediately after there's no real drama going on. It just becomes a gimmick or gimmicky, and that's what I found it to be ultimately." On January 25, 2013, The Walt Disney Studios and Lucasfilm officially announced Abrams as director and producer of Star Wars: The Force Awakens, the seventh entry in the Star Wars film saga, which is a rival saga to Star Trek for which Abrams previously directed. Disney/Lucasfilm also announced that Bryan Burk and Bad Robot Productions would produce the feature. Following the news that he would direct The Force Awakens, speculation arose as to Abrams's future with Paramount Pictures, with whom he had released all of his previously directed feature work, and which had a first-look deal with his Bad Robot Productions. Paramount vice-chairman Rob Moore stated that Abrams will continue to have a hand in the Star Trek and Mission: Impossible franchises going forward. Abrams directed, produced, and co-wrote the screenplay for, The Force Awakens, working alongside Lawrence Kasdan, following the departure of co-writer Michael Arndt. Star Wars: The Force Awakens opened in theaters on December 18, 2015. It grossed over $2 billion at the box office, making him the second director to make a $2 billion movie since James Cameron's Avatar. Despite its strong box-office performance and positive reviews from critics, the film was considered by some, including Star Wars creator George Lucas, to be too similar to the original 1977 film. He served as a producer on the 2016 sci-fi sequel Star Trek Beyond. Abrams produced The Cloverfield Paradox, a sequel to 10 Cloverfield Lane. It was released on Netflix in February 2018. Abrams also returned to produce a sixth Mission: Impossible film, alongside Tom Cruise, Don Granger, David Ellison, and Dana Goldberg. The film, titled Mission: Impossible – Fallout, was released in July 2018. Also that year, Abrams produced Overlord, a horror film set behind German enemy lines in World War II and directed by Julius Avery. In July 2016, Abrams reported that a fourth alternate universe Star Trek installment was in the works and that he is confident that Chris Pine, Zachary Quinto and Chris Hemsworth will return for the sequel. In September 2017, it was announced by Lucasfilm president, Kathleen Kennedy, that Abrams would be returning to Star Wars to direct and co-write the upcoming Star Wars: The Rise of Skywalker with co-writer Chris Terrio. In July 2002, Abrams wrote a script for a possible fifth Superman film entitled Superman: Flyby. Brett Ratner and McG entered into talks to direct, although Abrams tried to get the chance to direct his own script. However, the project was finally cancelled in 2004 and instead Superman Returns was released in 2006. In November 2009, it was reported that Abrams and Bad Robot Productions were producing, along with Cartoon Network Movies, Warner Bros., Frederator Films and Paramount Pictures, a film adaptation of Samurai Jack. However, in June 2012, series creator Genndy Tartakovsky stated that the production of the film was scrapped after Abrams' departure from the project to direct Star Trek. For this and other reasons, Tartakovsky decided to make a new season instead of a feature film. Also in 2009, it was reported that Abrams and Bad Robot Productions would produce a film based on the Micronauts toy line. However, a film has never gone into production. Abrams is married to public relations executive Katie McGrath and has three children. He resides in Pacific Palisades, Los Angeles, California. He is Jewish and his wife is Roman Catholic, and he sometimes takes his children to religious services on Jewish holidays. 2006 Jimmy Kimmel Live! Yes No No No Episode: "4.269"
2007 The Office Yes No No No Episode: "Cocktails"
2017 Nightcap Episode: "The Show Might Go on, Part 2"
^ "J.J. Abrams to Direct Star Wars: Episode IX! - ComingSoon.net". September 12, 2017. ^ a b "Carol Ann Abrams dies, Producer, author was mother of J.J. Abrams". Variety. June 5, 2012. Retrieved June 6, 2012. ^ J.J. Abrams: On Filmmaking. BAFTA Guru. May 8, 2013. ^ Warner, Tyrone (May 11, 2010). "J.J. Abrams not worried about writer's block on 'Fringe'". CTV. Archived from the original on July 26, 2010. Retrieved June 29, 2011. ^ "J.J. Abrams's mystery box". TED. March 24, 2011. Archived from the original on March 24, 2011. Retrieved March 24, 2011. 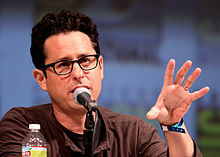 ^ "J.J. Abrams on Star Trek and Cloverfield 2". Comingsoon.net. February 23, 2008. Archived from the original on February 25, 2008. Retrieved February 23, 2008. ^ "NBC Picks Up New J.J. Abrams Drama Series". TVGuide.com. Archived from the original on February 15, 2011. ^ Seigel, Tatiana (June 17, 2008). "Paramount, Abrams keep house". Variety. Retrieved June 17, 2008. ^ Reagan, Gillian. "J.J. Abrams to Produce NYT's Fifth Avenue Mystery". New York Observer. Archived from the original on June 24, 2008. Retrieved June 18, 2008. ^ Green, Penelope (June 12, 2008). "Mystery on Fifth Avenue". The New York Times. ^ Schwartz, John (December 6, 2010). "Monumentally Mystifying: Power of Secrets Inspires Public Art". New York Times. ^ Pamela McClintock (May 6, 2010). "Abrams, Spielberg confirmed for 'Super 8'". Variety. Archived from the original on February 15, 2011. Retrieved July 27, 2010. ^ "J.J. Abrams Will Direct STAR TREK 2". NextNewMovies. Archived from the original on April 2, 2012. Retrieved December 6, 2011. ^ "Wrath of Khan Director Disappointed by Star Trek Into Darkness". November 25, 2018. ^ Graser, Marc (February 6, 2013). "J.J. Abrams will develop 'Half-Life,' 'Portal' games into films". Variety. Retrieved February 26, 2013. ^ "Stranger". Soonyouwillknow.com. Retrieved November 25, 2013. ^ "It's official: Abrams to direct new 'Star Wars' film". CNN. January 26, 2013. Retrieved January 26, 2013. ^ "Star Wars Is Being Kick-Started with Dynamite J.J. Abrams to Direct Star Wars: Episode VII". StarWars.com. January 25, 2013. Archived from the original on January 10, 2016. Retrieved January 26, 2013. ^ "J.J. Abrams directing 'Star Wars': What happens to 'Star Trek'?". The Los Angeles Times. January 25, 2013. Retrieved January 26, 2013. 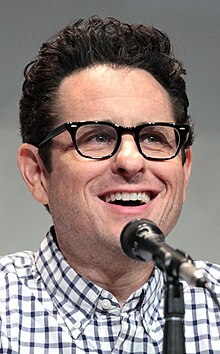 ^ "J.J. Abrams to script as well as direct". Guardian UK. August 25, 2013. Retrieved October 25, 2013. ^ "'Star Wars: Episode VII' script delayed". ^ "Disney Chief Reveals 'Star Wars: VII' Casting Almost Complete, Says Film Is Already Shooting (Video)". Retrieved July 4, 2014. ^ "God Particle is Cloverfield 3". October 26, 2016. ^ Pedersen, Erik (November 30, 2015). "Christopher McQuarrie Back To Write & Direct 'Mission: Impossible 6'". ^ "Bad Robot's D-Day Movie 'Overlord' Finds Director (EXCLUSIVE)". ^ "Is Chris Hemsworth Returning for 'Star Trek 4'? J.J. Abrams Teases Next Sequel". July 15, 2016. ^ Hipes, Patrick (July 18, 2016). "Fourth 'Star Trek' Movie A Go At Paramount; Chris Hemsworth Back As Kirk's Father". ^ Osborn, Alex (September 12, 2017). "Star Wars: Episode IX To Be Directed by J. J. Abrams". IGN. Ziff Davis. Retrieved September 12, 2017. ^ Kit, Borys (May 3, 2018). "J.J. Abrams, Paramount Plot Superhero Thriller From Overlord Director Julius Avery (Exclusive)". The Hollywood Reporter. Retrieved May 3, 2018. ^ a b "J.J. Abrams Once Had a Pitch for Who Framed Roger Rabbit 2". March 12, 2016. ^ "Cashiers du Cinemart Issue 15:". February 16, 2008. Archived from the original on February 16, 2008. ^ Stax (September 17, 2002). "Ratner Talks Superman". ^ McNary, Michael Fleming, Dave (August 12, 2004). "Par girding up for 'War'". ^ "J.J. Abrams Producing Samurai Jack: The Movie - Film Junk". ^ "A Preview of Sony Animation's Hotel Transylvania - ComingSoon.net". June 26, 2012. ^ Schuker, Lauren A. E. (November 6, 2009). "The Cry Goes Out in Hollywood: 'Get Me Mr. Potato Head's Agent!'" – via www.wsj.com. ^ "'G.I. Joe: Retaliation' Writers Offer Updates on 'Cowboy Ninja Viking,' 'Micronauts' and 'Epsilon' (Exclusive) - Movie News - Movies.com". Movies.com. ^ "Felicity Movie? Yes, Please!". ^ "EW Gets the Stories Behind Those Goofy TV Production-Company Logos", Entertainment Weekly, December 7, 2001: "The title came to creator J.J. Abrams during a writers' meeting, and he recorded his children, Henry and Gracie (ages 2 and 3), saying the words into his Powerbook's microphone. 'That day in the office while editing,' says Abrams, 'I put together sound effects on my computer, burned a QuickTime movie on a CD, gave it to postproduction, and three days later it was on national television.'" ^ "Jj Abrams, Katie McGrath 4th Annual Pink Party to... – Picture 2072721". Contactmusic.com. Retrieved November 25, 2013. ^ Director J.J. Abrams and wife, actress Katie – Media (3 of 46) Movie Premieres: 'Star Trek,' 'Angels, "Director J.J. Abrams and wife, actress Katie McGrath, parade on the red carpet as they arrives at Grauman's Chinese Theatre in Hollywood for the premiere of the movie 'Star Trek' in Los Angeles on April 30, 2009. ^ "About | Represent.Us". End corruption. Defend the Republic. Retrieved November 1, 2016. ^ Perry, Spencer (September 5, 2017). "JJ Abrams To Direct Star Wars: Episode IX". Comingsoon.net. Retrieved October 14, 2017. ^ a b c d e "The Academy of Television Arts and Sciences". Archived from the original on February 15, 2011. Retrieved February 18, 2008. ^ "Awards Winners". Writers Guild of America. Archived from the original on January 18, 2010. Retrieved October 17, 2007. Kamp, David (June 2013). 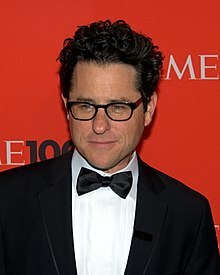 "What you should know about J. J. Abrams". In the Details. Vanity Fair. 634: 36. LaPorte, Nicole; Ifeanyi, KC (April 9, 2019). "Exclusive: J.J. Abrams on Star Wars, Apple, and building Bad Robot into a Hollywood force". Fast Company. "J. J. Abrams collected news and commentary". The New York Times.